"Cyclists have a joke about “racing in cat 6,”"
I gleaned this quote from an article linked by BikeSnob in which he waxes typical snark about the ridiculous measures commuters will go through to be, I guess, de moda (in style). He has a strong point about purchasing an $84 mini-messenger bag which amounts to nothing more than a fanny pack worn on your back. The Good magazine seems to posit that many commuters "race" and that they know it's called 'Cat 6'. 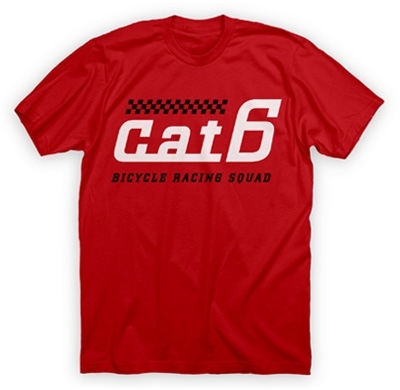 You can buy Cat 6 gear from TwinSix, so I guess somebody knows what it is. Interestingly, the 'ville doesn't have a huge number of commuters, and the ones I run across don't tend to be "racing". Perhaps she implies that all the hipster boys and girls on B'town are, in effect, "racing", but it seems like most folks are just commuting or riding their bicycles. Yes, we all get that little bit of "can I catch him/her?" or "maintain, maintain", but racing I think not. It is the first time in my cycling life however limited seeing the term 'Cat 6'. Apparently der Snob waxed poetic about it on Friday too. So is 'Cat 6' a term used by Cat 5's to denote physical superiority? "Ha ha ha, I'm fat, slow and middle-aged and just finished in the bottom 15, but at least I'm not riding Cat 6!! Cough. Wheeze." That means I'm not even Cat 6. How about Dog 6? I like dogs better than cats. T6 lays a sweet definition right where you linked us..."For people who don't want to race, but still want to be racers, there is Category 6 Racing Squad – an ever growing band of average Joes who ride fancy bikes, rock the mid pack lifestyle, and have egos that match their skill level. "...pretty succinct, eh? What about those of us who can't even "rock the mid pack lifestyle?" Can we be Cat Naught? Cat Naught? I think that'll work Andy. You make the shirt, I'll buy it and wear it.